Developers all over the world are working hard at this very moment to deliver their own unique, exciting experiences. Just like movies, television shows, and any other form of entertainment, the creative content often reflects the people who made it. That is why when it comes to Japan (east) and the West, the games they make are much like their respective cultures: different. While there are plenty of exceptions on both sides, below are some of the more typical ways Japanese and American/European game design styles (and genres) are different. One of the biggest and most obvious differences between the average Japanese game and Western game is how they look. While many American and European players say that Japanese titles are too vibrant and cartoonish, the majority of Japanese gamers wonder why Western games always have to be realistic and dark. 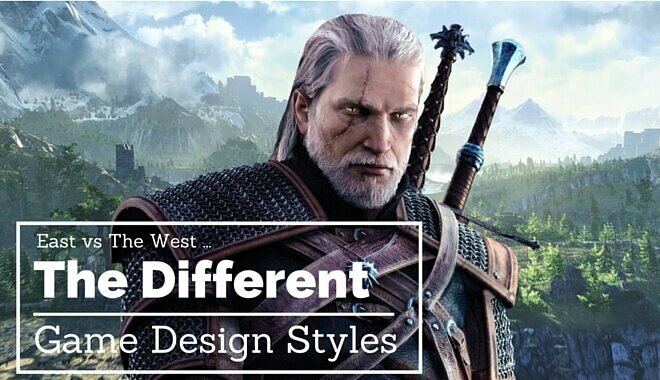 When you think about it, Western games do lean more toward realism as opposed to the stylized visuals you’ll find in most games made in Japan. All of these favor realistic graphics with darker, often grittier color schemes. In a recent interview, Japanese developer Keiji Inafune said this is the case because Japanese people grow up with anime and manga, which features more abstract and stylized drawings. On the other hand, Western gamers are used to realistic movies and TV shows and thus prefer that visual style in their games. If there’s one genre that separates the two regions the most, it’s role-playing games. While every developer making a story-driven game strives to create captivating characters and worlds, Japanese and Western developers tend to take different approaches. In Japanese games you’ll often find the same type of hero made popular by early titles like Dragon Quest. This hero (or heroine) normally has a clear, precise goal that takes them through a grand adventure where along the way they gain the company of various other characters. The hero/heroine almost always ends up having to “save the world” in some way, and the final battle is often against a celestial deity or god-like villain. Protagonists are also usually children or teenagers who have special powers and unrealistic hair. In Western games, the heroes are middle-aged men with a rough, strong look who are rarely doing what they’re doing to save the world. Instead, their goals are usually far more personal and involve things like vengeance (Middle Earth: Shadow of Mordor) or a love interest (The Witcher 3: Wild Hunt). Another common different between Western and Japanese games is the amount of choice a player has. A relevant example is the response from both regions toward Final Fantasy XIII when it released in 2009. While Square Enix’s title sold pretty decent in the West, more than a million copies sold in the first day of sale in Japan with nearly a million more flying off store shelves by the end of the year. While the game was highly praised in the east, western players and reviewers alike strongly criticized the very linear nature of the game that offered players little to no freedom. Upset with the low review scores in the West, the game’s director suggested that people not approach the game “from a Western point of view”. In other words, Japanese players have no problem with linear games as long as the gameplay is fun and story is enticing. Western gamers, however, want choices. They want a more dynamic story that is affected by decisions, branching dialogue trees, and the ability to check out side-quests and other areas whenever they want.